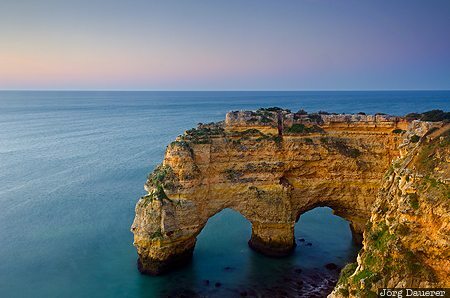 The double natural sea arch at Praia da Marinha (Marinha Beach) seen at the blue hour just before sunrise with the motion of the water of the Atlantic Ocean softened by using a long exposure time. Praia da Marinha is in the Algarve in southern Portugal. This photo was taken in the morning of a sunny day in March of 2011. This photo is part of the exhibition Sea Arches (June 2018). This photo was taken with a digital camera.